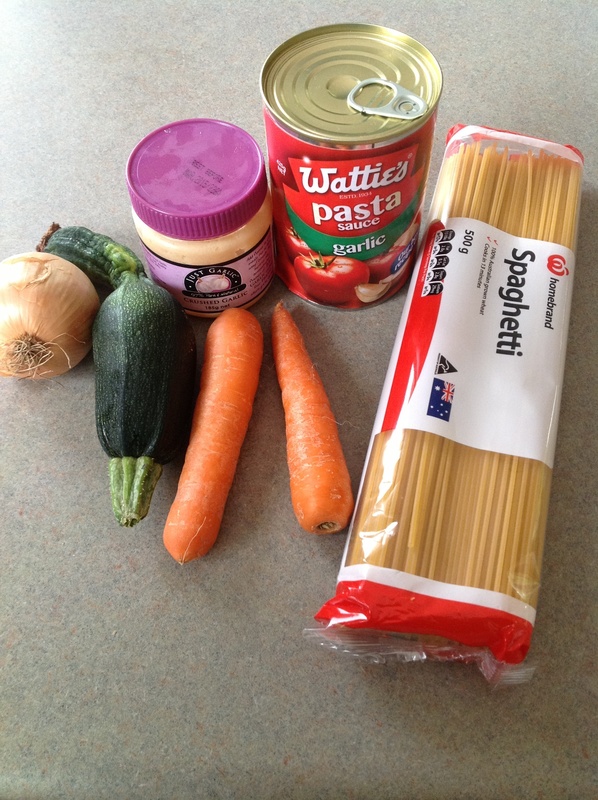 Day #29 – Spag Bol (and a random Zucchini from the garden) | Have kids, they said. It'll be fun, they said. Princess brought home a zucchini plant from kindergarten a fair while back, and Mr T and her happily planted it in the garden. I am not a gardener. I would love to say that I were. I would love to be able to grow veges – goodness, I would love to simply be able to differentiate between weeds and plants worth keeping. But alas, I can not. Yesterday, Mr T was watering his garden when he looked down and literally exclaimed, “what the heck is that?“. Princess carried it tenderly inside and said in excitement reserved only for little girls, “MUM! What’s THIS?! Wow!”. 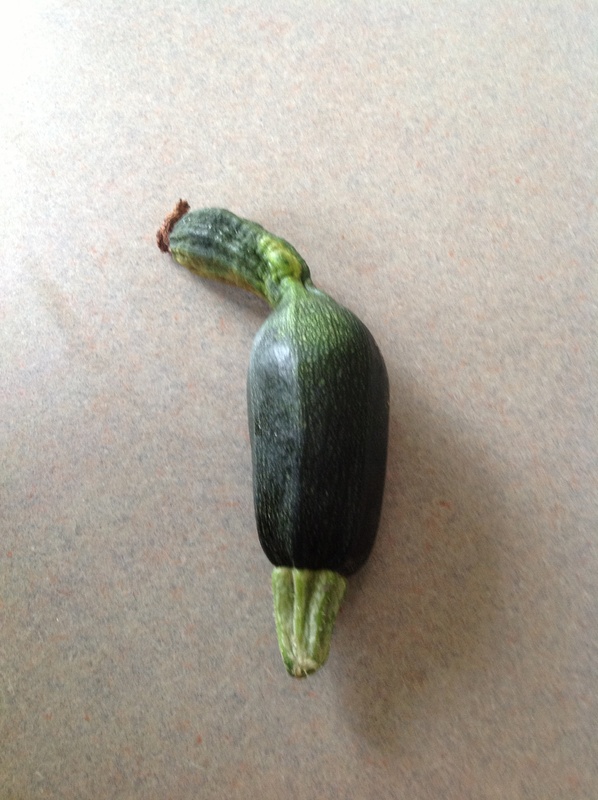 I told her is was a zucchini, and she yelled out the door, “IT’S A DOOKEENEEE, DAAAAAAD!”. Mr T informed me that he did not like zucchini. Not-at-all-not-one-little-bit. So, as I do with the kids, I hid it in the meal. 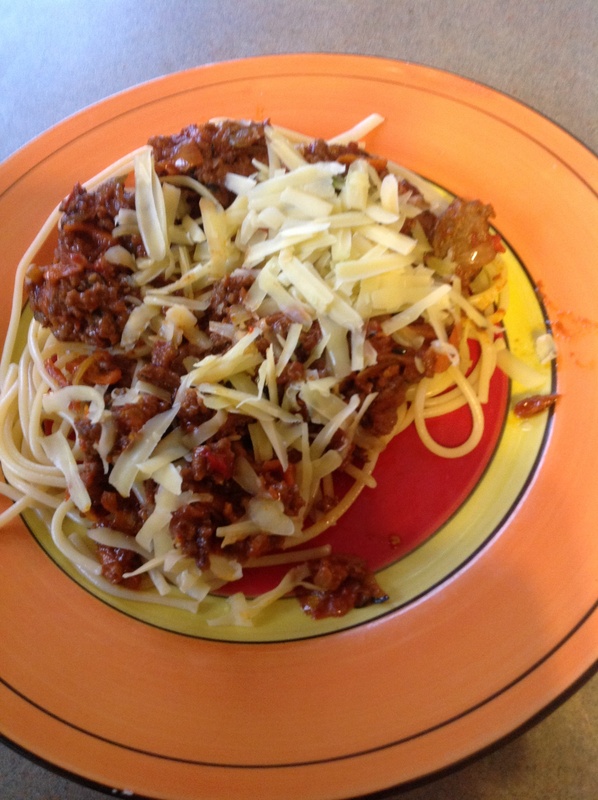 Tonight I cooked Spaghetti Bolognese with a sneaky zucchini grated all up in there. Cook the onion and the garlic for a few minutes and then add in the mince. Cook until browned thoroughly, then add in the pasta sauce. Grate the zucchini and carrot and add them in as well. This sauce is at it’s best if you can let it simmer over a low heat for a decent amount of time, the flavours infuse and are just devine. While cooking this, put the spaghetti into a pot of boiling water and let it cook until tender. Mix the sweet chilli sauce in just before serving. Add cheese on top if you prefer. Really good. The sweet chilli sauce added a nice flavour and the zucchini and carrot added a subtle crunch to the meal, I really liked it. And, Mr T said to me, “this is really nice, what’s the taste in here?”. When I said it was zucchini, he said I was a Sneaky McSneakerson. Well, duh – I’m a mum, it’s what we do.